Water. Sweetener. Fruit. Or Veg. 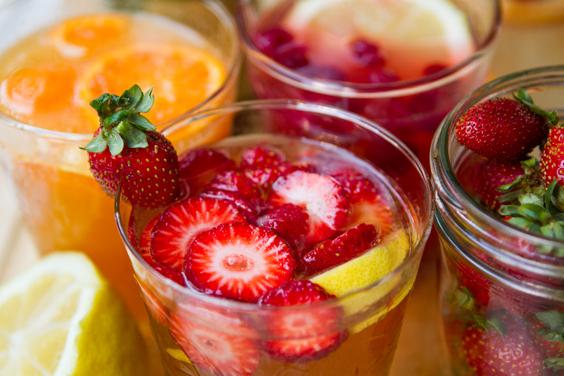 That's really all you need to made your own light, refreshing, sweet and sassy Agua Frescas. So cool, refreshing and easy to drink, these lightly sweetened sips are ideal for all you wildly thirsty "..but I hate to drink plain water" people - I can relate! Plus tall chilled fresca glasses sparkling in a sunbeam, dotted with colorful fresh cut fruit, offer some serious table-side eye candy. So pretty. 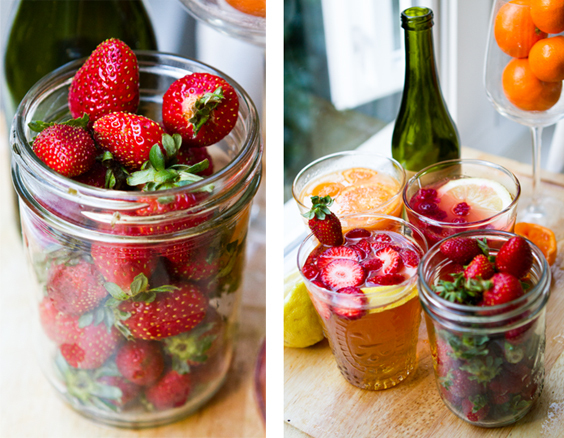 And I've simplified the traditional fresca recipe procedure -- meet my "Lazy Frescas" - easy!.. In case you haven't noticed, I really am getting back into the swing of my "California Girl" identity. 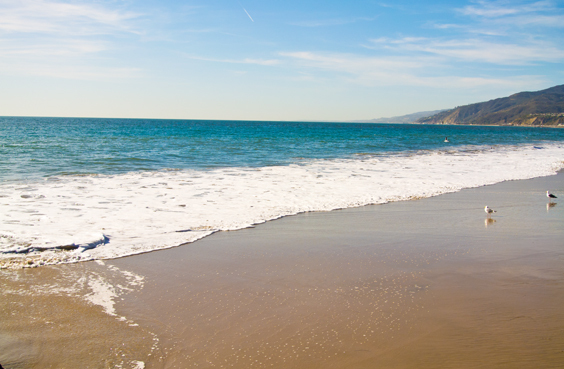 I am even requesting a beach cruiser bike for my birthday coming up this month. And so even though I know all too well that many of you are up to your noses in thick, puffy scarves. Red noses and cheeks. Winter boots set by the front door. I just have to post my lazy beach day frescas. 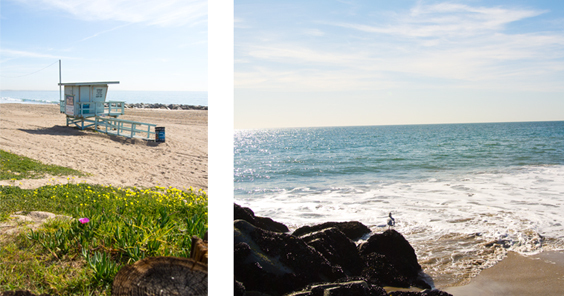 So even if you are sipping hot soy cocoa, maybe this post will give you a swig of sunshine. Citrus Peach. LOVED this flavor combo..
Lazy Frescas. Traditionally a fresca is made by pureeing fresh fruit and sifting the pulp out through some sort of mesh or cheesecloth like sieve. 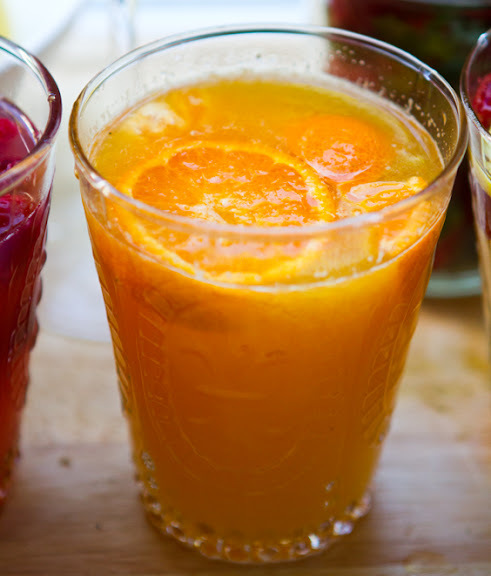 But I have found that you can still enjoy plenty of fresh fruit juice flavor without all the mess of sifting pulp. 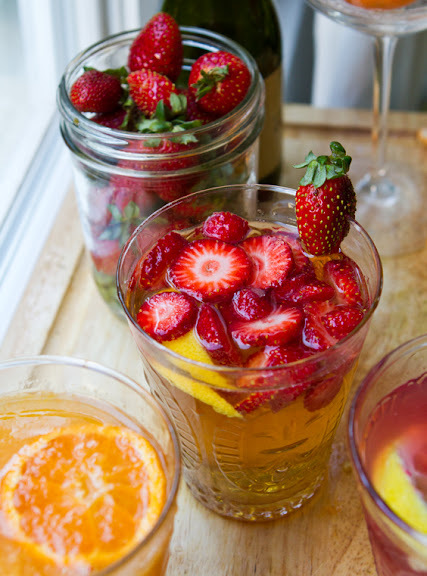 My lazy fresca version involves keeping the fresh fruit whole and really infusing the water with fruit juice. 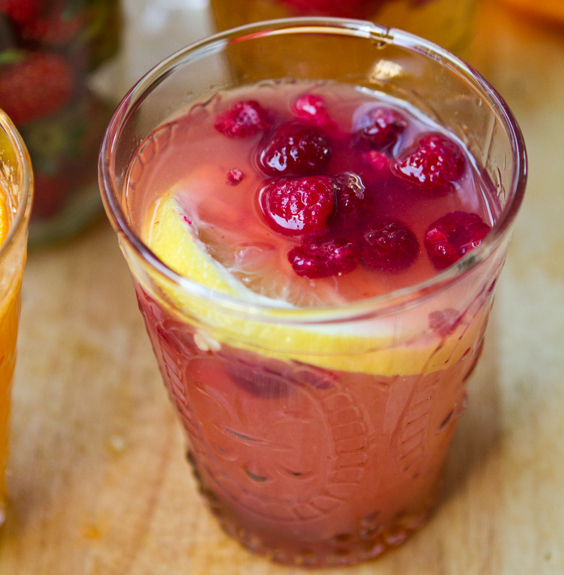 The frescas taste amazing and you can be sipping them in minutes with little cleanup. 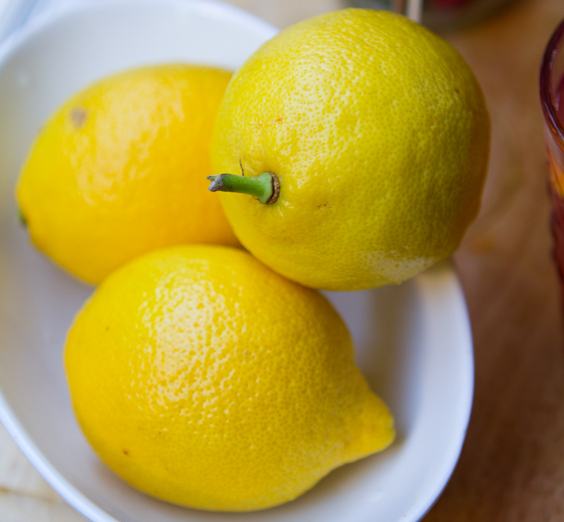 Farmer's Market Lemons (citrus is a must for frescas! Try lemon, lime or grapefruit for that tart bite)..
Make them your own! And remember - you can easily get creative and craft your own "lazy fresca" recipes. It's fun to combine flavors and do a little fresca taste-testing! So if try my recipes below - or grab whatever fruit or veggie is in your fruit bowl or produce drawer right now - you can probably create a fresca with it. I made a Trio of "Lazy Frescas" aka Agua Frescas. 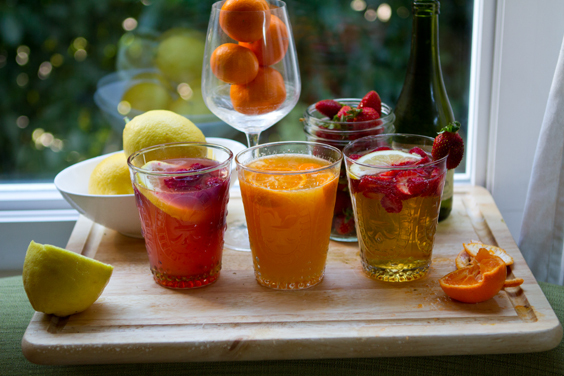 Recipes are "by the glass" - to make full pitchers, simply use same ratio of ingredients. To Make: Add all the ingredients (chill liquids and fruit first). Stir well. Best when you let the juices sit and marinate in the fridge for at least twenty minutes or so. Could even be made a day ahead of time. mint is a nice touch here too! Raspberry Coconut. Coconut water is delicious (and healthy) in frescas!.. Lazy Frescas. The trick to a lzy fresca is choosing fruit or veg that will easily dissolve into water when given a brisk stir and a gently mashing. It is almost like you will be making “fruit tea” Instead of a tea bag steeping in hot water, you are “steeping” some soft, ripe, fresh fruit. Step One: Choose your flavors. Try pairing a sweet fruit with a tart citrus. Or a mild veg with an herb. Here are a few ideas.. Step Two: Choose your liquid. I like to use sparkling mineral water because I like my frescos fizzy. But still water works too. Just make sure it is chilled. You can also add a splash of something sweet. I like to add a splash of fresh orange juice or something fizzy like sparkling lemon, peach, apple or orange soda. Step Three: Choose your sweetener. I like agave syrup because it easily dissolves into the water – and acts as a simple syrup. Step Four: Prep your fruit. 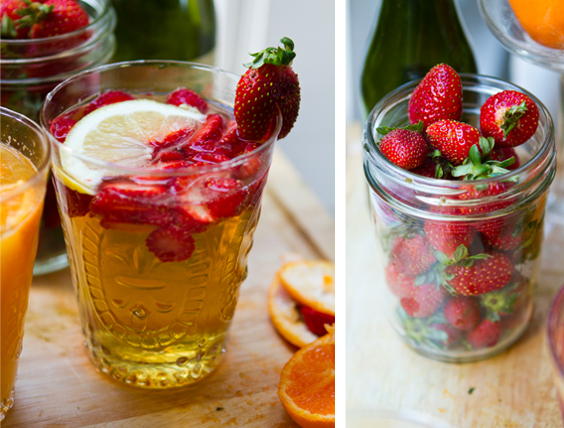 You will need a good amount of fruit per glass since this will be what flavors your water. Adding frozen fruit can be very helpful because as the frozen fruit melts into the water it easily saturates the water with flavor. (For instance, drop a fresh blueberry into water and not much will happen. But drop a frozen blueberry into water and it will turn blue!) 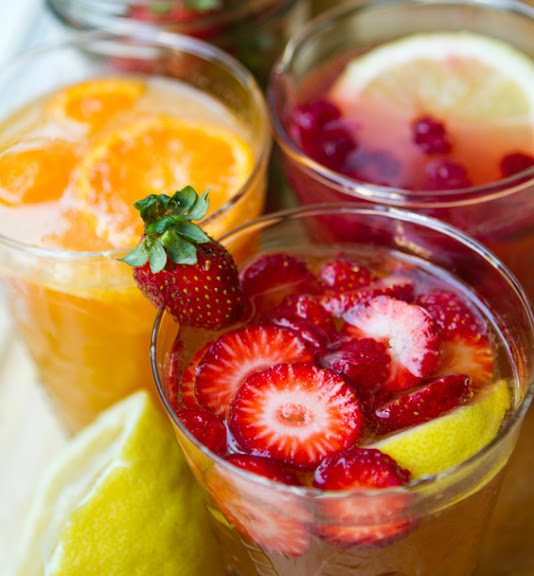 Frozen fruit also chills your beverage nicely. Another trick is to gently mash some of your fresh fruit to release the flavor. 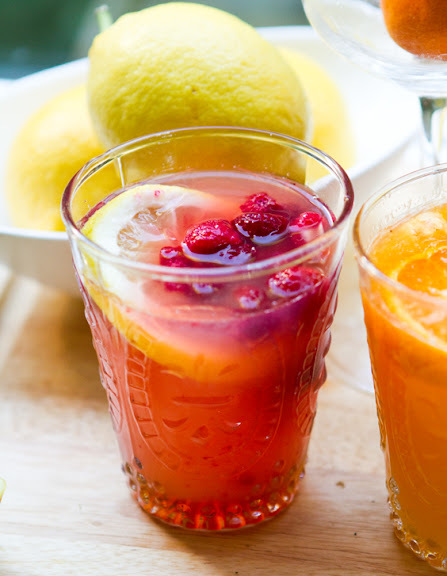 Add your fruit, sweetener, water to your serving glass. Stir/mash briskly and allow to chill in the fridge until ready to serve.